New Delhi, August 11: “Mhaari Choriyan Choron Se Kam Hai Ke?” This dialogue aptly suits the current situation with the male bastion being replaced by the all-woman squad for the first time ever. Crisp uniform equipped with essential arms, pulling up socks and these women squad are ready for action. 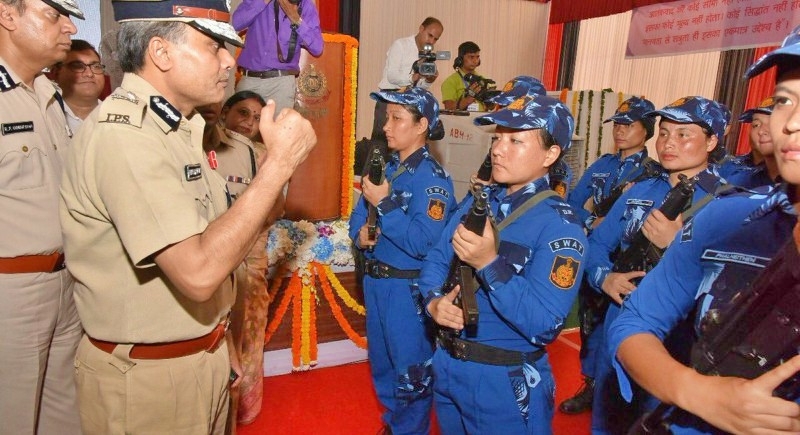 Union Minister Rajnath Singh formally inducting the unit, the police force in New Delhi will be the first in the country to have an all-woman Special Weapons and Tactics (SWAT) team. The team will be deployed for the security of the national capital as well as Prime Minister Narendra Modi on August 15, 2018. A team of 36 women from Northeast India is all set to combat situations that pose an extreme threat to security in Delhi. The SWAT team is the brainchild of Amulya Patnaik, the Delhi Police Commissioner, and comprises 36 women from the North East. The women comprising from the Northeast with 13 of them are from Assam, 5 from Arunachal Pradesh, 5 from Sikkim, 5 from Manipur, 4 from Meghalaya, 2 from Nagaland and 1 from Mizoram and Tripura, each. While SWAT teams are usually trained for 12 months, this team has received special training and are being said to be much stronger and dangerous for the enemy. The commandos have undergone rigorous training under specialists from India and abroad for 15 months. The commandos have undergone training to handle urban situations as well as jungle operations. Their expertise includes unarmed combat, ambush and counter-ambush and urban operations like building interventions, vehicle intervention, and VVIP security. Defining the women squad, Amulya Patnaik said that these women are second to none when it comes to handling terror strikes and hostage crises in urban areas. In fact, they were rated better than their male counterparts by their trainers at Police Training College in Jharoda Kalan. Their 15-month training also included the basic knowledge of explosives and Improvised Explosive Device (IEDs). They are skilled at using weaponry like MP5 submachine guns and Glock-21 pistols. Responding to emergency situations is extremely crucial for the special police team. The commandos will be stationed at strategic locations in Central and South Delhi as well as around the Red Fort and India Gate.